Description: ALCN-1 (41T) departs Allentown at CP-Burn behind CN and CR (NS) power. Description: Five CN locomotives yard their very long train, using two tracks to do so, while a yard engine idles next to them. Description: 41T rolls past the empty lot at McMaster St in Owego, which has been left unmowed, and is still a deep green, even this late in the year. 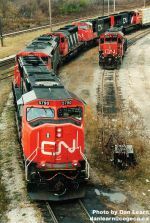 The IC power was not uncommon for a while, as any CN family power could show. Description: The shrubbery tended to lose its green earlier than the trees. We see a 36 car 41T rolling through Waverly past a patch of smaller trees that is already going yellow in this late September shot. Description: I think this is the old IC Saint Charles air right, the lines have been removed to the bridge to the right, the diamonds are in front. Antone out there with more info on these lines? Description: westbound rolls through Durand seen from the second floor of the depot. Description: just a little fog in the air. Description: Today the transfer comes up Shoreham Hill with an SD75 in the lead as it rounds the curve near Benjamin St Ne. Description: Westbound ethanol train rolls through town west bound while storms are visible to the east and northeast. Description: GTW 6420 leads CN L588 into Stevens Point, WI yard with an SD75I trailing. Description: A pair of EMD big boys power mixed freighter through Mount Albert. Description: Making the big turn at Highway 48 overpass.